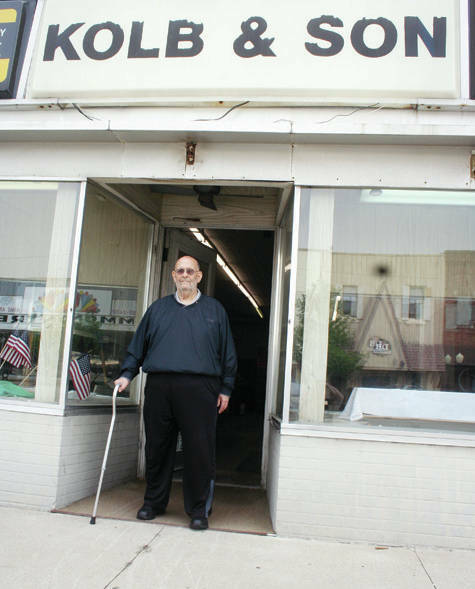 Retiring owner Joe Kolb has closed the Kolb and Son, a century-old Wauseon landmark. 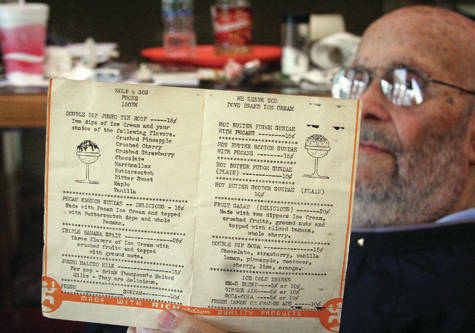 Joe Kolb displays a 1936 soda fountain menu from the store, with prices showing a double-dip Tin Roof for 15 cents and a double banana split for a quarter. The doors are closing on over a century of goods and good memories, but pieces of one of Wauseon’s oldest institutions will live on in a special venue. Kolb & Son, a downtown mainstay at 126 N. Fulton St. since 1917, has wrapped business after serving generations of customers throughout Fulton County. Whether looking for candy, ice cream sodas, photographic equipment, tobacco products, costume jewelry or novelty gifts, they could find it at the “everything” store, just like their parents before them. It’s the only job Kolb – who tells those who greet him, “I’m not Mr. Kolb. I’m just Joe” – had from the age of 10, when he was paid 50 cents an hour by his father and grandparents to clean up the store and roast peanuts for sale. It became full-time work after his high school graduation, and eventually a career. What he described as a confectionery store with odds and ends became his responsibility when his father, Don, passed away in the early 1970s. “I did feel the obligation to keep it going,” Kolb said. Stocked with a soda fountain and booths, a candy counter, and various sundries, Kolb & Son offered a bit of this and that, and became a cherished hangout for kids. Opened originally as Kolb & Geer, the confectionery store lost George Geer as a partner when he became Wauseon’s postmaster in 1936. The name change to Kolb and Son reflected the ownership of Kolb’s grandparents, Howard and Margaret, and his father, Don. When Don left in 1943 to serve in World War II, Kolb’s mother, Corabell, took a more active role. Joe Kolb partnered with his father after his grandfather’s death. When Kolb’s father died, he and his mother took over. By that time the store had branched out, offering cameras and photography services and selling luggage, novelties, billfolds, and watches. His son Brett Kolb, now Fulton County’s auditor, served the store for 20 years before being appointed director of the county’s Board of Elections in 2006. Like his father before him, Brett started at Kolb & Son while still in high school. “I grew up in there. I would walk to the store almost every day, hanging out as a kid,” he said. To whet his entrepreneurial appetite, his grandmother would set him up with a lemonade stand on the sidewalk. Brett Kolb worked there even as he pursued his political interests. When small businesses began struggling against the lure of big box stores, he developed competitive services for Kolb & Son, such as taking high school senior and wedding photographs. Brett Kolb said his time at Kolb & Son taught him courtesy, kindness, and respectfulness. “I enjoy working with people. I think that’s what the store gave me,” he said. Mayor Huner said she feels sad over Kolb and Son closing permanently. She still remembers the “amazing” smell of the store’s roasted peanuts wafting along the street. Portions of Kolb & Son are due to receive a second life. Sauder Village in Archbold has accepted historical artifacts from the store to used in the village’s 1920 Main Street Project. They include the original soda fountain, the accompanying booths, mirrors, a ceiling fan, and tiles. Joe Kolb said he’s proud that Sauder Village chose pieces of his store to live on in its exhibit.